Last year one of my goals, actually a goal for both my wife and I, was to make a serious dent in our mortgage. We set a fairly aggressive long-term goal to have our house paid off by our 10 year anniversary in July of 2016. We moved into our current house in April, 2011, so we had a super-stretch goal of having it paid off by the time we had been in the house for 5 years (April 2016). Our goal last year was to pay off 30% of our mortgage in 2014. We had some unexpected downs, as well as some unexpected ups in the year. We set aside 3 months in the middle of the year to be intentionally even more aggressive than normal – we ate out less, found a few ways to trim on some budget categories, cut a lot of what we spent on entertainment (such as TV service) and in general found ways to live on less for a short period of time. Even with a few things that popped up over the year, we finished with a total of 32% paid off. This was huge compared to the two previous years – only 5% paid off in 2012 and 15% paid off in 2013. Looking ahead at 2015, we have at least one big change that will affect how aggressive we can be. We are expecting our 4th child by the end of the month, which will push pause on my wife’s part-time employment for a few months. I have been picking up some side-work (is there anyone out there with a 5-10 year old website in need of an overhaul?) to compensate. Because of this, we are being a bit more conservative and setting our goal to pay down the mortgage by 25%. Above my desk and work and at home, I have a chart showing our progress. It shows relative percentages, not dollar amounts – (green: % paid off in a given month, blue: % remaining, yellow: original 15 year curve). It helps me keep my eyes on the goal, knowing that everything we choose not to do with our incomes is worth it by seeing the progress that is being made. 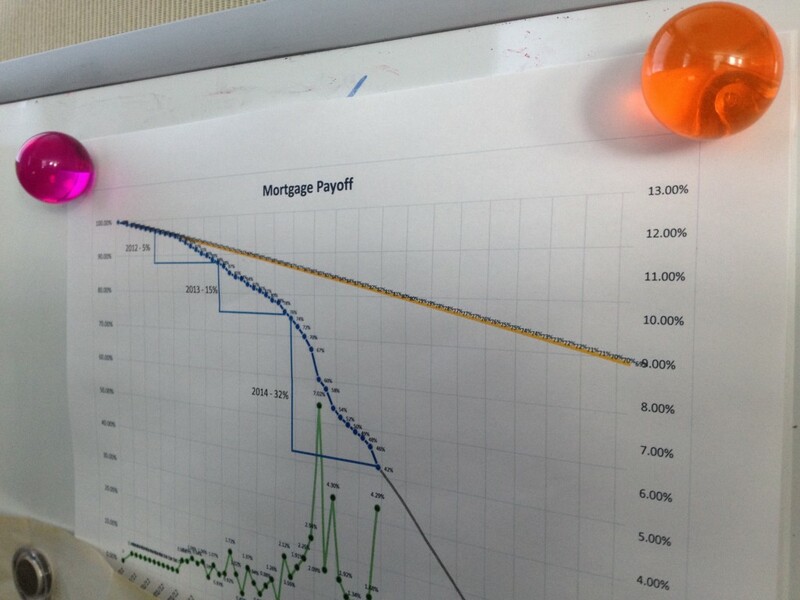 We have a 15 year mortgage (2011-2026), and if we were making minimum payments, at month 45 out of 180, we would have a 80.7% remaining balance, compared to 40.02%. We have in effect knocked 75 months worth of payments off – even if we had to switch to minimum payments today, we would be done before 2019 – a full 6 years early. So, why bother to write about this goal and share it with the world? Isn’t money usually a sensitive issue? Well, yes it is, but I’ve tried to keep numbers as percentages not actual dollar amounts. I chose to share this goal in particular because maybe, just maybe, it might inspire someone to do the same. It is indeed possible, with focus, to pay a mortgage off quickly and free one’s family from the shackles of debt. With out a large portion of your paycheck going to a bank every month, what could you be doing instead? Saving for kids college? Giving to those in need? Be able to handle increases in the cost of living (such as health care) without stress?